“It is not enough to place colors, however beautiful, one beside the other; colors must also react on one another. Otherwise, you have cacophony”. We will talk about mixing our colors, whether from commercial paints , dry pigments, or oil paints. Getting them to the place where they will do all that they can do. Where we can glaze, whether by brush or pouring, to create a harmonious and beautiful color experience. 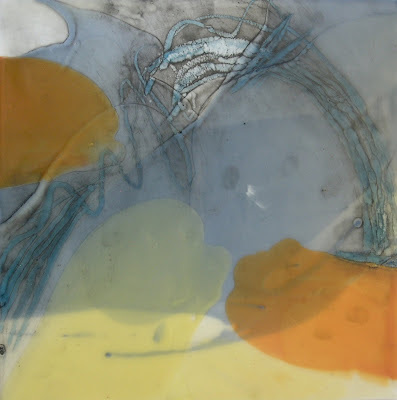 We will consider what glazing can do for us, and how to achieve beautiful glaze affects. And how to most effectively apply the paints to achieve our goals, whether by small pours or brushing. Create a multi layered paintings in a variety of ways.. 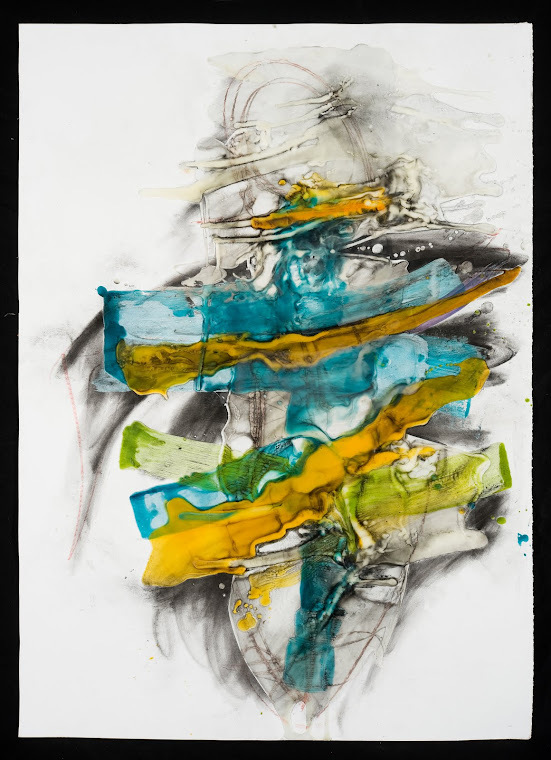 Using transparent layers, with a variety marks to help separate them, to help give them depth and beauty. Understanding that color is all about relationships. How colors affect each other, and what happens when they overlap each other. AND COLD WAX: just to add an extra dimension, and because Cold Wax is hot right now, we will add a segment on painting with cold wax, as well. 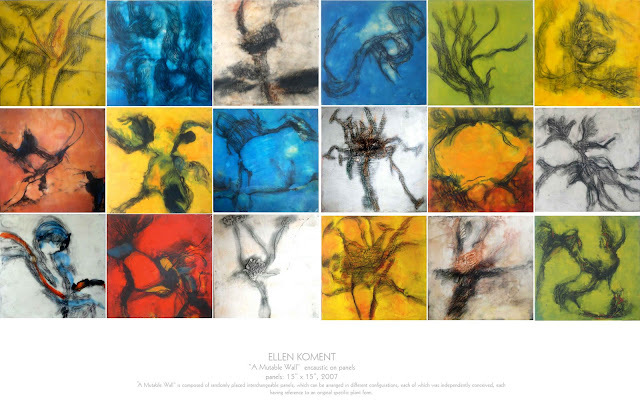 Ellen Koment taught Color Theory at the College level for many years. All materials except panels are provided, although there will be a short list of optional materials . This workshop will be an opportunity to enhance your work with a variety of new techniques, as well as taking it to a new scale. 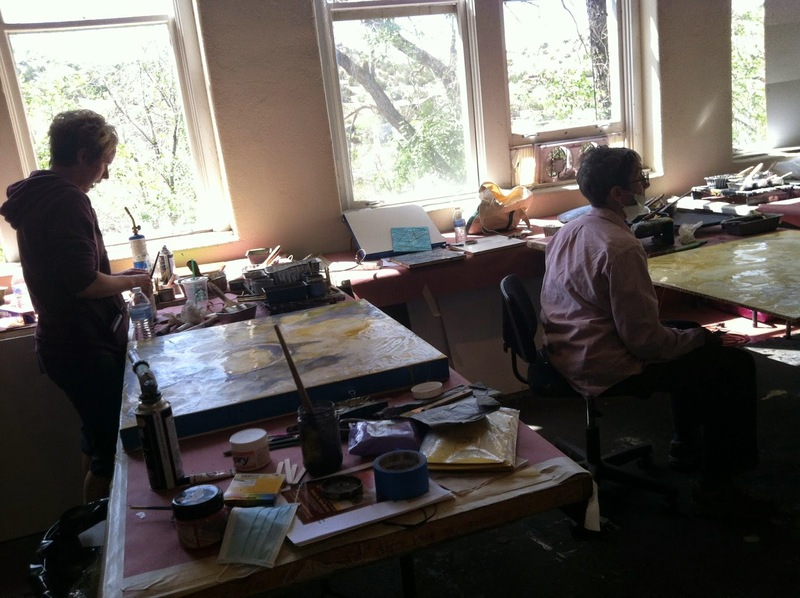 Individual instruction and criticism will help you move your encaustic painting to a new level. And just for fun, a little taste of cold wax painting as well..
MOSTLY, IT IS ABOUT MAKING THE PAINTINGS YOU WANT TO MAKE, at a larger scale! 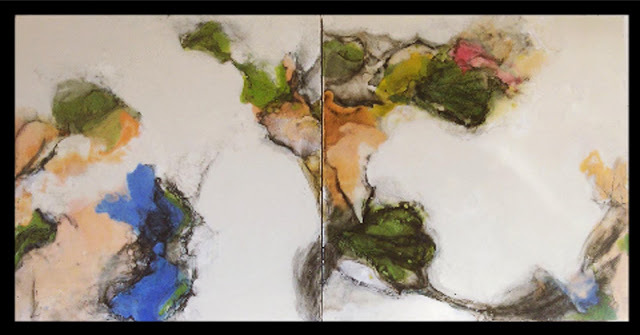 Koment, Blossoming, dyptich 36" x72"
For people with encaustic experience or significant painting experience in other media, it will be an opportunity to take your work into a new dimension. 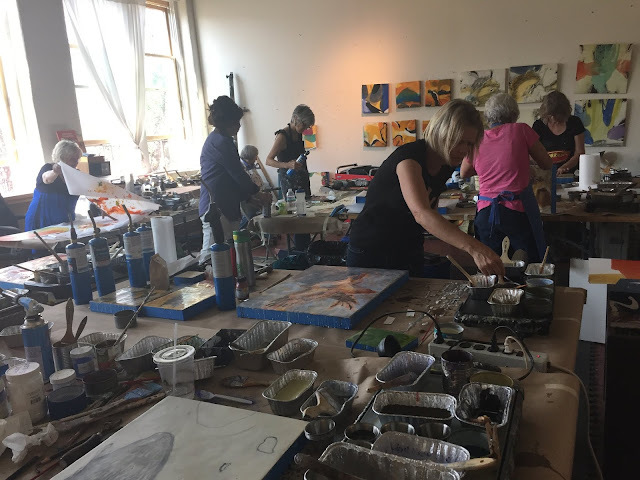 The workshop will combine the expertise of a mature artist both with hands on demos and ample time for students to work, as well as portfolio reviews for individual participants, and advice related to professional development. I will share techniques and work one on one with each student either in creative coaching, a professional development session or a portfolio review. It is open to artists at all levels. 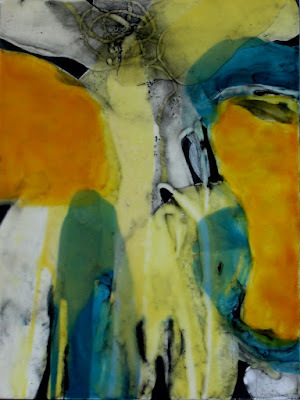 Many people stay at a certain level with their encaustic painting because they see working at a larger scale, or changing their approach, as intimidating. It does present certain challenges, but when you understand how to overcome them, it can be a richly rewarding experience. 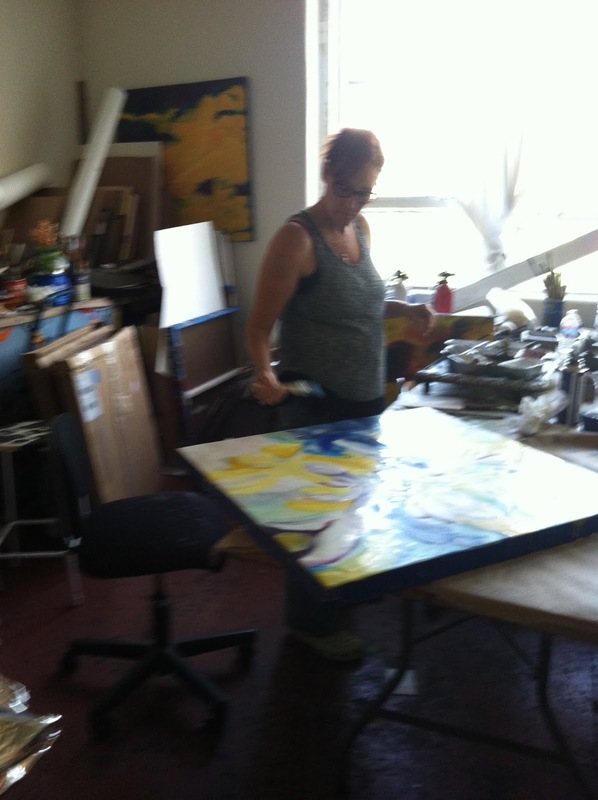 This workshop will allow you to work up to 30" x 30". It will address all aspects of working larger, from the planning and drawing stages, through preparation of the surface; understanding temperature control and how it facilitates working larger, handling color and glazing, as well as special effects, and finishing. 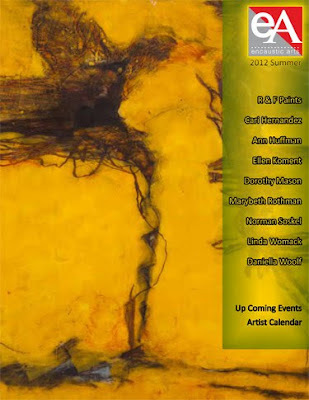 A number of new techniques will be presented: use of dry pigment and encaustic on incised line, and a variety of additional mixed media approaches, basic color and glaze theory, creating texture and working with photographic and other mixed media, and maybe alittle about COLD WAX! Think about combining a number of smaller panels to create one big one. Think outside of the box! 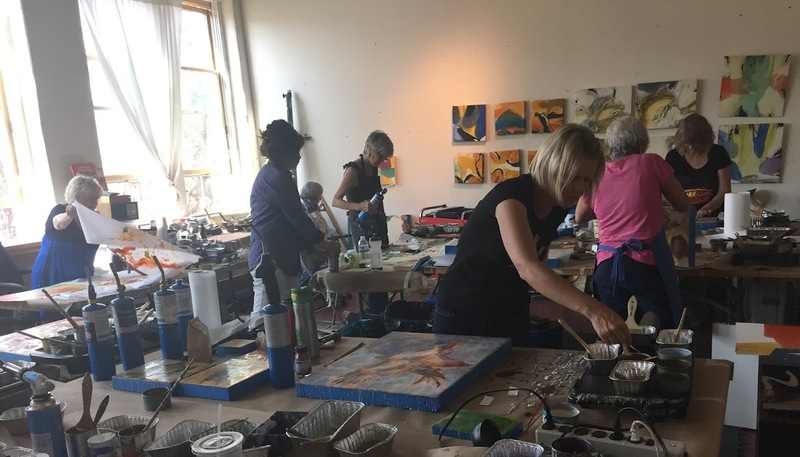 The workshop will review all the basics, including information about how to make paint, about the commercial paints and their applications, about supports, grounds and techniques: paint application, fusing, glazing, inscribing and mixed media approaches.safety, materials, demos of applying paint, glazing, fusing, How to get that smooth surface! Learn some new techniques: Introducing mixed media, working with oil bar, pigment, creating lines and texture. 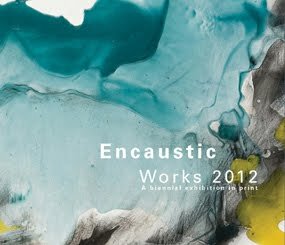 We will emphasize how these techniques can be developed to create a unique encaustic language for each student. 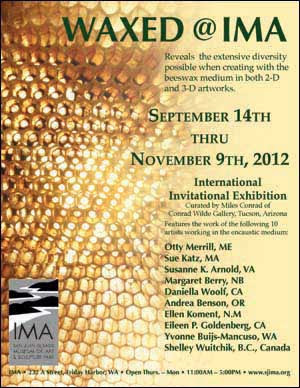 We will talk (and demo) how to create glaze layers, and about the evocative use of color. We will demo and try some special techniques like inscribing and using dry pigment..and, you will leave with a printout containing all the information you need as well as a list of suppliers. 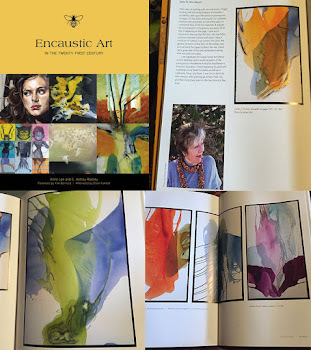 Represented in three recent books, "Encaustic Art in the 21st Century " Encaustic Works 12. 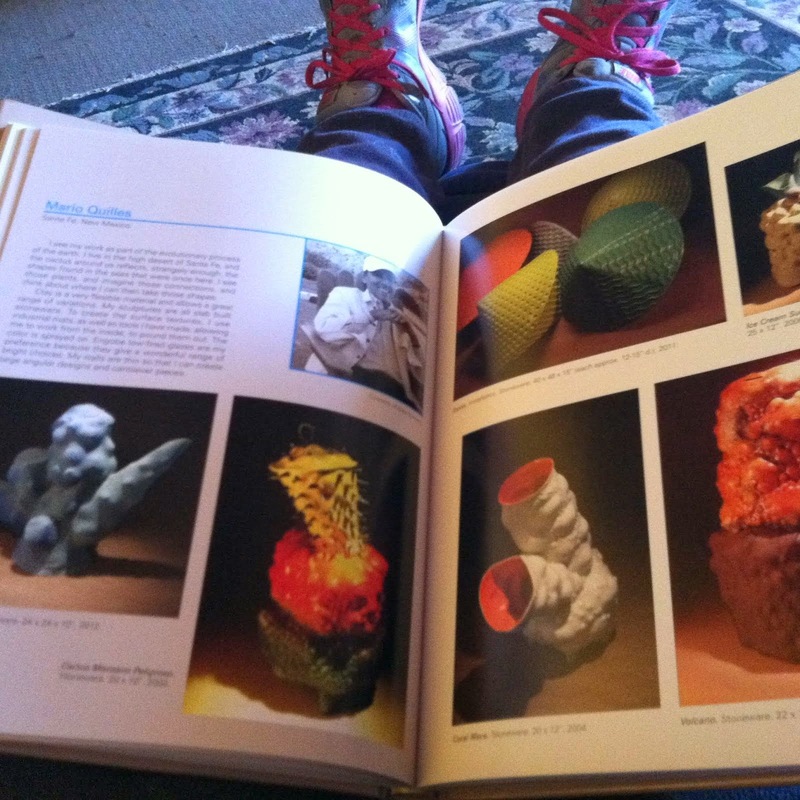 Contem"
Ashley Rooney's "Contemporary Art of the Southwest", coming out later this year. Mario Quilles and I are both included!